In my last blog post I talked about the process of actually getting to Surrey, today I thought I’d talk about actually settling in here, making friends, and my first few months in what I now consider my second home. The first weeks – first few months, really – at Surrey flew by incredibly quick, as cliché as that sounds. It seems like only yesterday I was unpacking my stuff in Flat 54 Ernst Chain (shout out to the current occupants) and waiting for the weekend for the rest of my flatmates to arrive. First was international orientation, then came fresher’s week, Halloween, Guy Fawkes, mid-term assignments, and before we knew it, it was Christmas, time to go back home, and a whole 3 months had gone by. Even though it seemed it lasted only minutes, it was a pretty busy time in terms of settling into being at university. 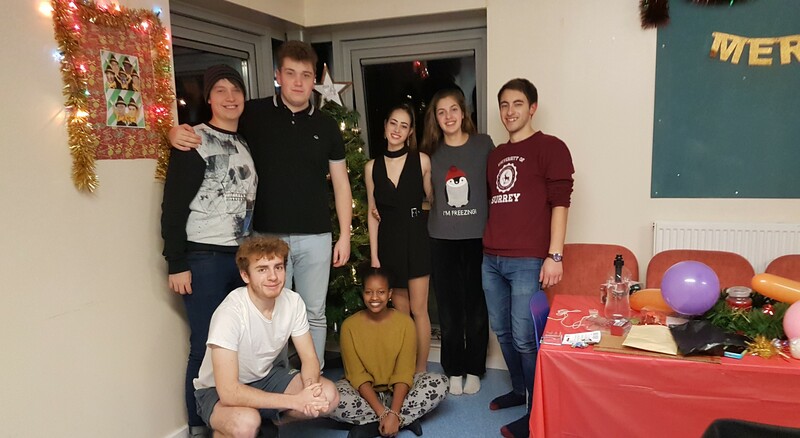 By the time we broke for Christmas, I had pretty much solidified my groups of friends, fallen into a routine academically, sorted out my housemates for second year (more on this later! ), submitted four assignments, done three tests, engaged in a few different societies, attended a whole lot of events, and a whole lot more. The first few months at university – between getting there and breaking for Christmas – are what I like to think of as the settling in period. In my view, this is the bit where you’re still acclimating to life at university, discovering your friend groups and your routine. While obviously you should be focusing on your course, the fact that this period is not as academically demanding means that it is the perfect opportunity to build your relationships and forge connections with these people that are going to be in your life for the next 3-4 years – and hopefully a lot longer. Treasure this time. For me, it really did make all the difference between having a good and having a great time at university. Once that little hurdle of friend-making was over, I began to really delve into being abroad and embracing this newfound life. Guy Fawkes night, more commonly known here as bonfire night or fireworks night. 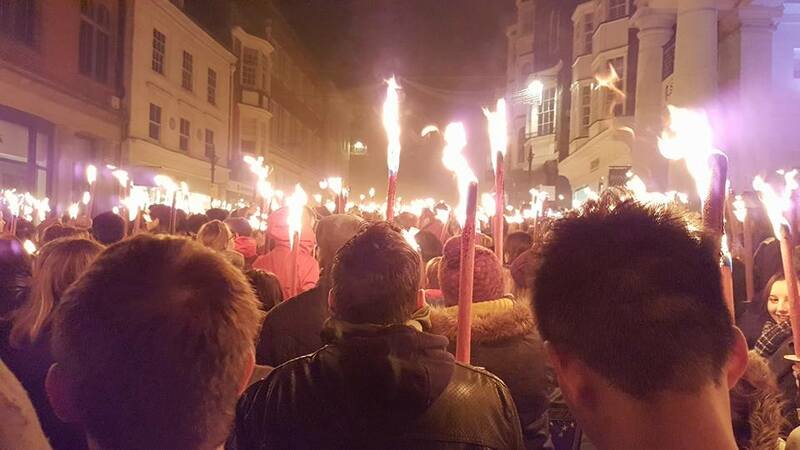 Guildford town has this super cute tradition where the whole town is invited for a torch-lit procession up the high street, all the way down to Stoke park where there is a fair (with lots of rides and delicious foods), a bonfire and, you guessed it, fireworks. I was always very excited to go off to university and start a new life abroad. I was never nervous about living on my own or being so far away from home, but if there was one thing I was slightly anxious about, it was making friends. I tend to be quite shy and reserved when I first meet new people, and can also be painfully socially awkward. I was really worried that I wasn’t going to click well with anyone, and that I wouldn’t find that close-knit group of friends. The great news is, I did. 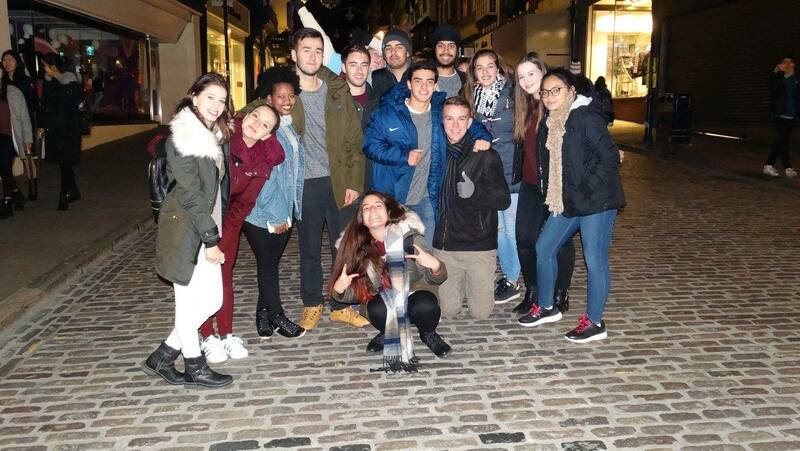 It’s incredible to think how this time last year I had only just met everybody, and how now, only a year later, they make up some of my closest friends. Looking back on it now, my friends and I always joke about how nervous we were with each other back then. I do think having a group chat before-hand helped massively, though, because it meant we already sort of knew each other and it sped up the friend-making process a little bit. Within our first few days we had already gotten the obligatory picture on the stag – everyone needs to get one, were you even at surrey if you didn’t take a picture by the stag? This was our flat towards the end of the year last year. 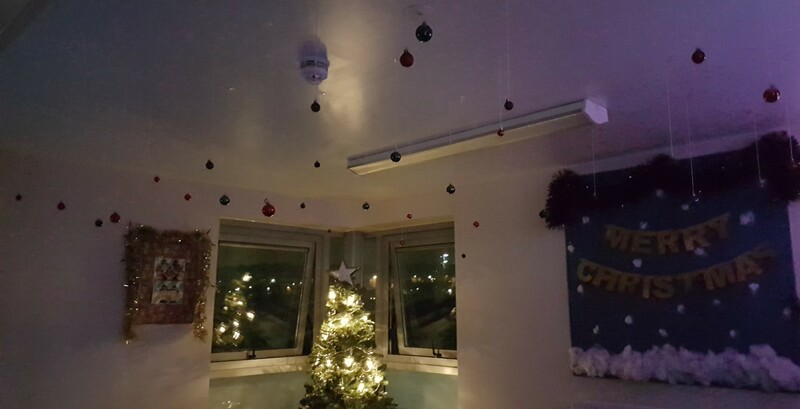 The mentors of Manor park organised this Christmas competition where the flat that had the best decorated kitchen won a flat meal. We made what I thought was a pretty valiant attempt (above), but, alas, we didn’t win. We did get a special mention though! I know it can be daunting, the concept of having to move away to a place you’ve probably never been before and make friend with a whole new group of people – trust me, I’ve been there! The most important thing to remember is that everyone else is just as nervous as you! 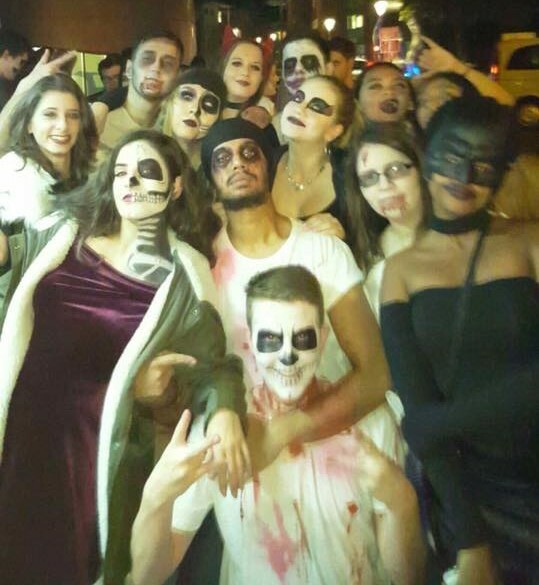 Unlike in school where you may be moving to a new place and trying to assimilate into groups that are already friends, at university, everybody is new. Like you, probably no one else has been in that situation before, and we’re all coming in as just as clueless and as nervous as each other. What I believe is that the less you try and force things into motion, the easier they fall into place. I found that the less I worried about it, and the more I focused on simply enjoying myself, the quicker and easier I met and made friends with new people! Instead of putting pressure on yourself and giving in to this idea of how many friends you should have by when, try and relax and just go with the flow. Once you realise that all everybody wants to do is make friends, this will be a lot easier than you think. So, while it is okay to be a little nervous, take comfort in this fact! Hopefully I’ve made some sort of sense in my advice. 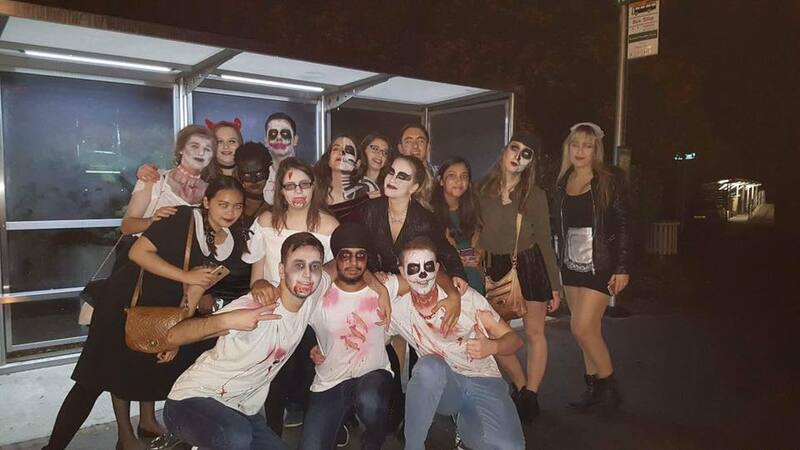 But, if not, feel free to email international@surrey.ac.uk to have myself or any other student ambassador talk to you more and/or answer your questions on this and anything else. That said, rant over, see you all next time!